Not all homes have outdoor space. So if you have a patio in your room, cherish your blessing by making it practical, comfortable, and beautiful. Bring in some lounge furniture, an outdoor dining table and chairs. You can even add some mood lighting as well when decorating the patio. The possibilities are endless, as you can decorate your patio cookouts, parties, or to simply enjoy viewing the sky every night. 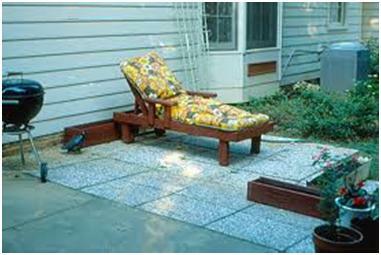 The following are some tips on you can decorate your patio, especially during spring. They say first impression is the last impression. That is why you need to enhance your front entrance in a way that gets the visitors visually pleased before they enter your home. And it’s not that hard to achieve. You may not believe it, but with a single coat of brightly colored paint on your front door, you can redefine the look of your home. Couple this up with a doormat and a knob with a burnished bronze finish and you are good to go! The best furniture and outdoor kitchen equipment can make up for a dirty deck. So get a pressure washer (or a broom if gets the job done) and clean up the place. Now you are ready to for decorating the patio. But that is just step one of the process. Ultimately, you are aiming for comfort, and this can be done by creating a similar ambience in your patio as you have indoors. If you designing your home from scratch, you should aim for a cohesive style that makes it easy for you to move indoor decor outside, and use colors, furniture finishes, and accessories that complement each other. In addition, try to mix and match patterns, textures, and sheens to have a more sophisticated outlook. When we are talking about home décor, accessories go well beyond their basic aesthetic purpose. Rather, they add the finishing touches to your room, patio in this case, to create a polished look. For instance, a weather-resistant rug can have a beautiful design and color, but also offers great function. And of course, we cannot miss out on flowers when decorating our patio. Go for big, bright ones, such as red geraniums. 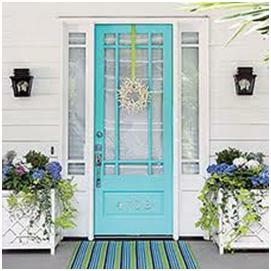 These are not only affordable, but they remarkably brighten up your outdoor space. Finally, you can always use accent pillows (enter hyperlink for ‘Home Décor with Pillows’Article). Be realistic about your space. In practical terms, this means you should avoid cramming in a family-sized couch in a space that only allows for a table and a couple of chairs. So do make sure that the furnishings you choose for your patio fit in and give you to space to move around in. If your patio can be viewed from outside the house, remember the tip on keeping a cohesive style. Make sure that your patio design matches with the general outlook of the house, otherwise it will not at all appear pleasing to the eyes. Most importantly, choose furniture that”s built to last outdoors. For instance the fiber fillers in outdoor furniture cushions repel moisture and resist mildew, and the fabrics are ‘heat-proof’. Finally, if you have a patio, chances are that you will have friends and family over at one point or another. So set up your space to host parties all season long. Quick tips to do so include hanging up string lights (or even placing solar lights) around the patio, add colorful throw pillows for your guests to sit back and relax, and if possible, have an herb garden or a fruit tree from which your guests can take natural eatables, complimentary on the house! Follow these tips and make the most out of your outdoor space. And if you are interested in high-quality outdoor furniture and accent pillows, contact KOVI today!